COA officers together with Samar I Inspectorate Team during inspection. 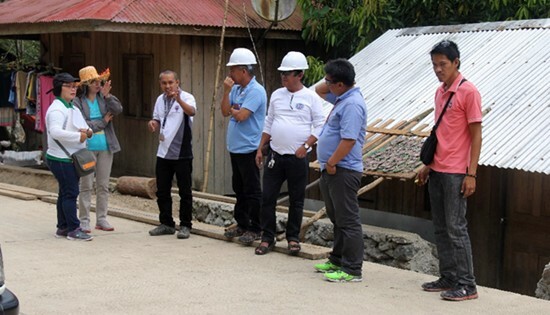 CALBAYOG CITY – To ensure just use of revenue and expenditures of funds owned or held in trust by the government, the Commission on Audit (COA) conducted technical evaluation on four infra projects by Department of Public Works and Highways – Samar First District Engineering Office (DPWH-SFDEO) last February 23, 2016. 4. Construction/Improvement of Access Road leading to Bangon Falls, Brgy. Tinamplacan, Calbayog City, Samar 1st LD with P42,434,015.07 contract amount. Under contract with B. Vicencio Construction, projects under the DOT Convergence program are registered as 100% and 95% physical accomplished based on the February Infra Project Update. Both FMR projects, under contract with N.A. Ibarra Construction and RNMK Construction & Development are registered as 60% and 80% physical accomplishment respectively. COA reports that the legal and auditorial review of all contracts and project accomplishments of the above mentioned infra projects are found in order. QUEZON CITY – An estimated 1.2 million college and vocational graduates this month will find difficulty in getting a job due to a growing mismatch between their training and the job skills required by most of employers, said the labor group Trade Union Congress of the Philippines-Nagkaisa (TUCP-Nagkaisa). Recent data from the Department of Labor and Employment (DOLE) showed that out of the 4, 239,392 domestic and international job vacancies offered in 3,686 all year-round job fairs activities held in 2014 and 2015 nationwide, only 391,088 were hired on the spot out of the 1,286,073 applicants. “This job-skills mismatch crisis in the country has been on going and it continues to grow. Competition is getting higher so employers are putting additional qualifications into the job descriptions for them to compete. Heightened competitiveness at the job market without or little adjustment at the learning institutions is what makes this crisis thrive,” said its spokesperson Alan Tanjusay. “With employers adding more qualifications, graduates’ credentials will be scrutinized longer. This additional layer in the procedure could mean additional training which entails further cost and perseverance for the applicant. While those who fall through the cracks will become unemployed or underemployed,” he said. The same record showed that in 2015, 1,661 job fairs were held and an estimated 135,590 were hired out of 487,640 applicants. In 2014, 2,025 job fairs were conducted by government and employers all throughout the country with about 255,498 were hired out of 798,433 applicants. Records from Commission on Higher Education (CHED) showed there were 656,284 college graduates in March 2015 while records from the Technical Education and Skills Development Authority (TESDA) showed there were 1.6 million individuals certified as of October the same year. In DOLE’s Labor Market Information (LMI) Report for 2013 to 2020, it identified key 275 occupations as in-demand and 102 occupations are listed as hard-to-fill from among key and emerging industries. In-demand occupations refer to active occupations/job vacancies posted or advertised recurrently. These occupations have high turnover/replacement rate and are essentials in the operations of a company. In-demand occupations include abaca pulp processor, admino programmer, banana growing worker, bangus diver, banquet supervisor, bamboo materials craftsman, fish cage caretaker, groundskeeper, multi-lingual service crew, mussel grower, pointman, reefman, and whale shark interaction officer. Hard-to-fill occupations, meanwhile, refer to job vacancies to which the employer/company is having difficulty to be filled because job applicants are not qualified or there is no supply of job applicants for the particular vacancy, the report said. Such occupations include 2-D digital animator, agricultural designer, bioinformatics analyst, clean-up artist, cosmetic dentist, cosmetic surgeon, cuisine chef, ethanol machine processing operator, multi-lingual tour guide, in-between artist (animation), in-between checker (animation), and mechatronics engineer. PASAY CITY – Independent vice-presidential candidate Sen. Francis “Chiz” Escudero said the next administration should offer incentives to lure renewable energy developers into the country to ensure a stable supply of electricity. The vice-presidential frontrunner said providing tax incentives to companies that would venture into renewable energy development will help keep a steady supply of power in the long-run in areas with energy woes like Bantayan Island in Cebu, also known as the “egg basket” of the Visayas. “It’s a pity that many of parts of our country still experience power problem when we already have the resources for various renewable energy projects,” Escudero said. “We have to come up with incentives for investors to consider renewable energy development, which is not only sustainable but a cheaper power source as well,” he added. Data from the Department of Energy showed that as of 2014, only 37 percent of generated power was supplied by renewable sources while 63 percent came from non-renewable energy, mainly coal. Of the renewable sources, less than one percent was from wind and solar energy. Escudero, who is running as Sen. Grace Poe’s vice president under the Partido Galing at Puso, stressed the need to resolve the region’s power shortage as he pointed out how tourism and business outsourcing, which are thriving in the region, are dependent on power. The veteran lawmaker said power problems and the lack of infrastructures are preventing the Philippines from becoming a top tourist draw even though the country has more beautiful sights to offer than its neighbors in Southeast Asia, such as Bantayan Island’s powdery soft white sand beaches. Last year, 5.36 million international tourists visited the Philippines but was just over half of the DOT’s five-year target for 2016 of 10 million arrivals. (Sitting L-R) Supt Erwin Portillo, Deputy Provincial Director for Operations of Leyte PPO, Colonel Francisco Mendoza Jr, Commander of the 802nd Infantry Brigade, Mayor Elmer Codilla and LtCol. Roberto Sarmiento during the signing of MOA declaring Kananga, Leyte as Stable Internal Peace and Security area. KANANGA, Leyte – A former NPA stronghold in Northern Leyte declared as Stable Internal Peace and Secured area in a ceremonial signing of Memorandum of Agreement (MOA) in Kananga, Leyte on February 29, 2016. 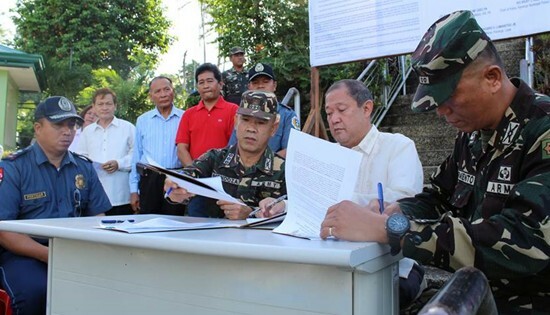 The joint declaration was pursued upon the recommendation of the Philippine Army’s 19th Infantry Battalion upon the legislation of Resolution No. 20R.14-791 by the 20th Sangguniang Bayan of Kananga, Leyte. Signatories to the MOA were Colonel Francisco Mendoza Jr., Brigade Commander of the 802nd Infantry (Peerless) Brigade, Senior Superintendent Franco Simborio, Director of Leyte Police Provincial Office represented by Superintendent Erwin Portillo, and Mayor Elmer Codilla and witnessed by Lieutenant Colonel Roberto Sarmiento, the Commanding Officer of the 19th Infantry Battalion, Chief Inspector Ricky Reli, the Chief of Police of the Municipality of Kananga and Vice-Mayor Macario Lumangtad Jr. Previously, the 19th Infantry Battalion declared 15 Leyte towns as Stable Internal Peace and Security areas. These towns are Matag-ob, Merida, Palompon, Tabango, Barugo, Babatngon, San Miguel, Leyte, Pastrana, Tolosa, Dagami, Calubian, Sta. Fe, Alangalang and Tunga. The aforesaid towns were declared Stable Internal Peace and Security because the actual threat of the Communist Terrorist Movement (CTM) is already downgraded and is no longer significant to influence the residents. Col. Mendoza is optimistic that the declaration will further attract the influx of investors to establish business in an area that has environment of peace. “We cannot achieve it alone. But we will continue with our effort to attain just and lasting peace in Kananga, Leyte”, Mendoza added. 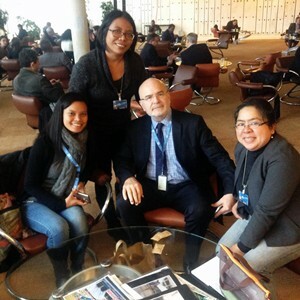 GENEVA, Switzerland – Michelle Campos, daughter of slain Lumad leader Dionel Campos, and Karapatan human rights workers Karapatan Secretary General Cristina Palabay and Karapatan-Caraga coordinator Dr. Naty Castro, met United Nations Special Rapporteur on the Situation of Human Rights Defenders Michel Forst in the sidelines of the 31st UN Human Rights Council sessions in Geneva, Switzerland on March 2. In the said meeting, Campos narrated the September 1, 2015 killings in Lianga, Surigao del Sur, where her father, grandfather Datu Juvello Sinzo, and school director Emerito Samarca were killed before the whole community. "Six months after the incident, not one of the three named perpetrators has been arrested. This is the kind of impunity that is perpetrated by the Aquino regime and the Armed Forces of the Philippines – they do not arrest criminals in their ranks and among paramilitary groups. They even have drinking sprees with them," Campos said, recounting her relatives' experience on December 30, 2015 when they saw Loloy Tejero, one of the suspects at large in the Lianga massacre case, having a drinking spree with members of the 75th Infantry Battalion, Philippine Army. Castro said that the more than 2,000 evacuees in Tandag, Surigao del Sur continue to suffer the consequences of such impunity. "It is worrisome that the issues of increasing military operations in Mindanao, including indigenous peoples' communities, and plunder of their ancestral lands remain low among the priority electoral issues among national candidates," she stated. Palabay said Karapatan notes and appreciates Forst's report in the 31st UN Human Rights Council on the cases of attacks against human rights defenders in the Philippines delivered on March 3, 2016. In the said report, Forst stated that he "considers the killings of Messrs. Emerito Samarca, Dionel Campos, and Bello Sinzo to be systematic of the aggressions suffered by human rights defenders in rural areas and indigenous communities in response to violations committed in the course of environmentally dubious mining operations, wide-spread development of monoculture plantations, land grabs and territorial disputes." He expressed regrets that there were reports of further killings in Mindanao after the September 1, 2015 massacre in Surigao del Sur. He urged the Philippine Government to "take every possible measure to ensure that these extrajudicial killings do not remain in impunity, for fear of the potential encouragement a lack of justice would provide for any potential perpetrators of such acts in the future." Forst also lamented the attacks against human rights workers of Karapatan, specifically the surveillance and intimidation of its members, as a result of their legitimate human rights activities and exercise of rights to freedom of expression and association. e) Illegal arrest, detention and harassment of peasant leaders in White Culaman, Kitaotao, Bukidnon. MAKATI CITY – With the recent educational shift to K-12, The Commission on Filipinos Overseas (CFO) featured Edukasyon.ph to help the 27,500 students and their OFW families in searching for the right Senior High Schools for their children. Edukasyon.ph is a free website platform that gives choice, convenience, and advice on education to career options around the Philippines. NAVAL, Biliran – The construction/ improvement of access roads leading to declared tourists destinations along Higatangan circumferential road, phase 3 has been allotted with P45 million under the CY 2016 General Appropriations Act (GAA). As of December 17, 2015, Construction of Higatangan Circumferential Road, Phase 2 under the CY 2015 GAA has already been completed. DPWH regional office 8 is undertaking the phase 1 portion of the project with an appropriation of P100 million and with a concrete paving length of 3.780 kms. under contract with Yoyen Enterprises while phase 2 was implemented by Biliran DEO with an appropriation of P40 million with a concrete paving length of 2.20 km (Sta.4+256.60 - Sta.6+500) under contract with B. Vicencio Construction. “The P45 M fund is set for the rehabilitation of existing substandard concrete pavement complete the improvement of the entire Circumferential Road”, said District Engineer, David P. Adongay Jr.
Adongay also reported that the Construction/Improvement of 3.780 km. in Higatangan Circumferential Road (HCR) implemented by the regional office 8 under CY 2014 GAA is still on-going with clearing and grubbing operation and base course preparation on one section of the project as of January, 2016. The completion of the Improvement of Higatangan circumferential road will provide an access road not only for local and foreign tourists but also for the residents of the place in going to and from to the island’s tourist destinations such as the Higatangan’s popular 200-m shifting sand bar, rock formations, Marcos Hill/ Lighthouse, crystal clear watersand – its fine white sands which has been declared as Tourism Development Area through Republic Act Number 10409. The said island is only a few minutes ride by small boat from Biliran’s capital town, Naval. MANILA – A year after Republic Act (RA) 10654, which amended the Fisheries Code of 1998, was passed, fisherfolk associations, civil society organizations and environmental NGOs are underlining the gains of the amended law in a press conference held today. Calvan added that the reason more than 75% of our fishing grounds are overfished, as mentioned by BFAR in the National Stock Assessment Program, is due mainly to the long decades of neglect in implementing the Philippine Fisheries Code of 1998, leading to the destruction of coastal and marine resources.